Each year we welcome new board members at Twin Lakes, and this year we are delighted to welcome Ned Cline, a Twin Lakes resident and retired journalist and biographer; and Melanie Thomas, a quality management director with Freedom House Recovery Center in Chapel Hill. Our board selection process involves a careful consideration of the mix of credentials and backgrounds that is necessary for the board to function well, and the success of our organization is a reflection of this deliberate approach. For a complete list and biographies of all board members, click on the Welcome Home tab on our website, then click Leadership/Board. Lanes of Light 2018 was a tremendous success! Through our community's efforts and the broader community's support, 26.5 TONS of food was donated to The Salvation Army food ministries. 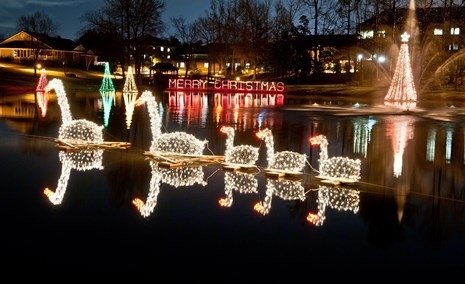 Lanes of Light is an award-winning mile-long drive through Twin Lakes Community dressed in holiday style. Through the joint efforts of our staff and residents, our 215 acre campus is transformed into a winter wonderland filled with festive fun. Dozens of illuminated trees, a sixty-foot sea serpent, and other holiday designs create a beautiful reflection as they float on our lakes. A larger-than-life Toyland with a live jack-in-the-box is the delight of children young and old. Those displays as well as all other wooden designs are the creation of our resident woodworkers and artists. Additional displays are designed and created each year. Santa, Mrs. Claus, The Grinch, and Frosty the Snowman are always dressed in full holiday attire to greet visitors. And, the favorite of all visitors is the residents of Twin Lakes who enthusiastically stand at their court entrances wishing every visitor a Merry Christmas! Requested admission is canned food or a monetary donation for the benefit of The Salvation Army food pantries. Through Lanes of Light, a true labor of love, over 245 tons of food has been given to local food ministries. Please join us for Lanes of Light 2019, December 7th and 8th, 2019! Twin Lakes is currently accepting deposits for our last phase of new garden homes. Garden homes are free-standing, three-bedroom, two or two-and-a-half bath homes with an attached garage, attic and terrace, as well as optional Carolina Room and screened porch. The homes range in size from 1780 square feet to nearly 2400 square feet. The development will be built in three phases, Davenport, Nightingale, and Carmichael Courts, with completion in the spring and summer of 2020. Twenty-five of the twenty-eight homes have been secured by future residents. 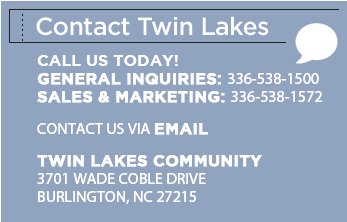 For more information contact the Sales and Marketing office at 336-538-1572 or jstovall@twinlakescomm.org. At this year’s Leading Age North Carolina spring conference at Grove Park Inn in Asheville, N C, Cherese Wolfe joined an elite group of award recipients by garnering top honors for the Service Excellence Award. This award honors those in direct service who demonstrate extraordinary talent, expertise, and dedication in the provision of exceptional service to residents. Cherese serves as the social worker for our Independent Living and Deacon Pointe Assisted Living residents at Twin Lakes Community. 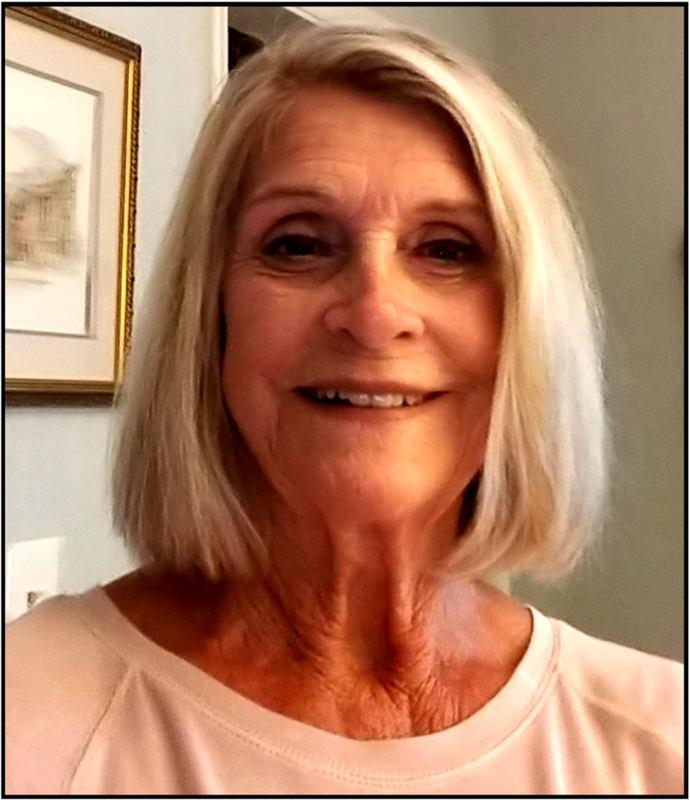 She has been a Licensed Clinical Social Worker since 2001 and joined the Twin Lakes staff in 2016. Leading Age North Carolina is the state association of not-for-profit providers dedicated to providing quality care, housing, health, community and related services to the elderly. Twin Lakes Community is grateful for Cherese’s dedication and service, and we are proud of her well-deserved recognition. Cherese (l) is pictured with Twin Lakes Quality Assurance Officer Connie Poovey who nominated Cherese for the award. In a ceremony June 7th, The Auxiliary of Twin Lakes awarded Evelyn Apple Scholarships valued at $40,000 to 25 students, children and dependent grandchildren of Twin Lakes employees, for college and technical school study. Evelyn Apple Scholarships are funded by residents in honor and appreciation of Twin Lakes staff. In its 16 years of operation, the Evelyn Apple Scholarship Program has made 184 awards, a total of $246,100, according to Robert Demaree, Scholarship Chair. Pictured are this year's award recipients.